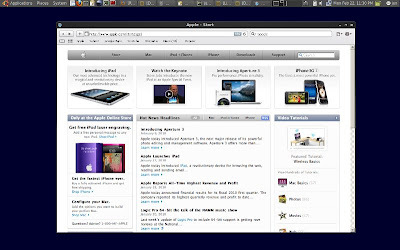 Installing and Running Safari 4 on Ubuntu Linux: As some of you may know, Apple's Safari is the default browser of Mac OS X and iPhone OS. Safari 4, the latest version of the browser, offers a lot of features and noticeable performance improvements over its predecessor. Step-1: Install Wine. The easiest way to download and install Wine is via Ubuntu Software Center or Synaptic Package Manager. Step-3: Install winetricks, corefonts, and flash. Step-4: Download Safari for Windows from HERE. 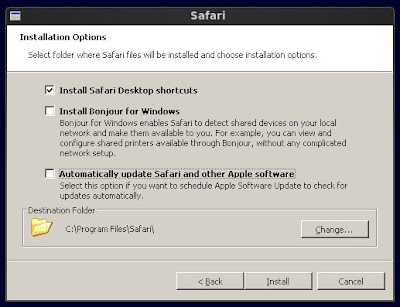 Step-6: Install Safari but make sure to uncheck (deselect) the "Install Bonjour for Windows" and "Automatically update Safari..." options. Step-7: Start Safari by navigating to Applications --> Wine --> Programs --> Safari --> Safari. * Safari will crash the first time you run it because of the welcome animation, but should work after that. * If Flash was not successfully installed, manually download and install it while using Safari on Linux. * Opening a new tab in Safari may cause it to crash. To fix this, open Safari preferences, and in "General" category, set "New tabs open with:" option to "Empty Page". Hello, I have installed Safari, I see it in Wine, I can at it to my panel, but it will not start, I click on it and nothing happens, can you help. Same thing here, using Ubuntu 9.10 with 64bit file system. Your instructions worked flawless and I can see the safari icon under wine as well ... but clicking on it will not start the program. No error message either. Could it be related to 64bit of Ubuntu 9.04 versus 9.10 ??? Works fine here. I had to manually update the sha1sum checksums for flash in winetricks, and Safari didn't crash when I ran it first time, but otherwise everything is OK.
i can download that flash, but i don't know how to install it. its worked like a charm,but netflix doesn't let me login. Thanks to guide me how to install safari into ubuntu. nu merge pe linux 9.10 luicid linux ce sa fac? I'm having an issue where Safari keeps crashing, because it won't stop playing the welcome animation and I can't stop it before it crashes -- any thoughts? same here, I can see it alright but it keeps crashing. Just hurry and randomly type something in the address bar, it'll leave the welcome page and not crash. Then change homepage or whatever. I just set mine to "empty page"
Is there a way to install safari on ubuntu without using wine? yeap :) worked just fine ! Thanks. but how can I install something from the cdrom? The animation used to run everytime and crash all the time. Next time I started safari, I typed something in the google search and pressed enter before the animation starts and then it started working fine. Why on earth would anyone want to use crapware(safari) on a linux system? What the hell is wrong with using Opera or a different webkit browser? Yes, I know Safari uses Webcore. Or hell, pay for Mac OSX. safari crashed after install. I re-installed it through winetricks. Works for me now.